This post is continued from the previous post, about Yellowstone’s gray wolves. The center of Yellowstone National Park, near old faithful, averages approximately 200 inches of snow fall each year. 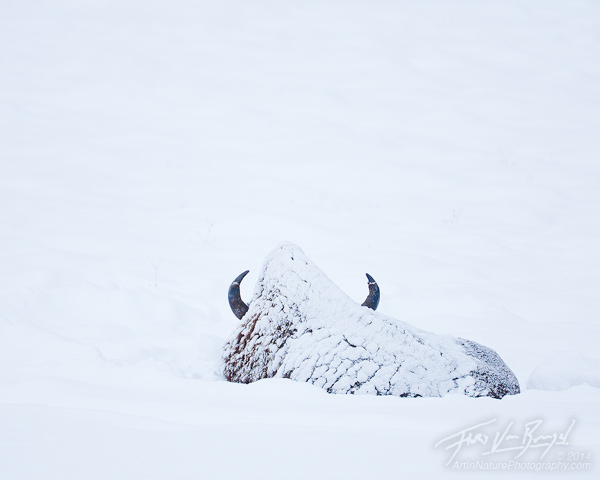 In such deep snow it would be impossible for the grazing wildlife (bison, elk, moose, and antelope) to find food. 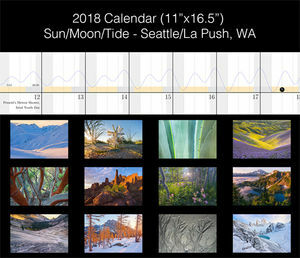 This forces them to adopt one of two general strategies: stay near the hotsprings that keep the ground free of snow, or move to the almost desert-like northeast part of the park, the Lamar Valley, which gets as little as 25 inches annually. 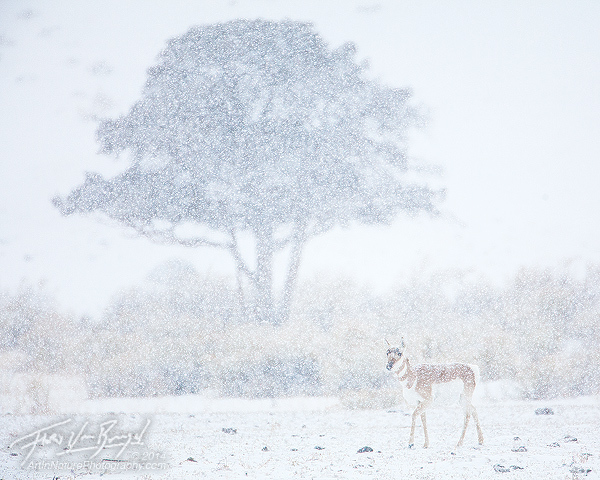 Despite this low annual precipitation, several times throughout our stay we were fortunate to have periods of significant snowfall, covering everything (including the wildlife) with a pristine white coating. Although Yellowstone National Park is most famous for its resident wolves, many other species make their home in the park. The coyotes, bison, antelope, elk, etc. are much easier to find and photograph, opening up more creative compositional opportunities. Our first afternoon we happened to find a friendly and good looking coyote (some were very mangy). We watched him settle down for an afternoon nap, and found him in exactly the same spot later that evening, hunting for dinner under a beautiful sunset. 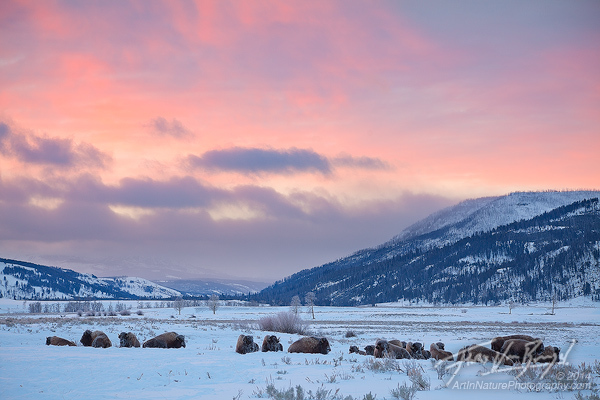 A coyote hunts for dinner in the fading light of sunset in the Lamar Valley of Wyoming's Yellowstone National Park. 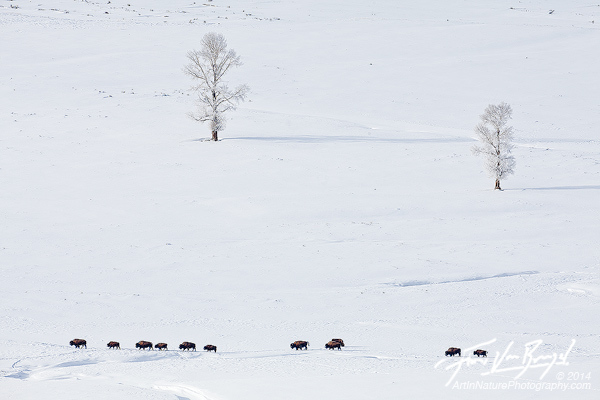 The most ubiquitous wildlife are bison, which frequently cause traffic delays as they slowly amble down the roads to get out of the deep snow. Early in the morning, however, they are still (usually) bedded down from the night. We had one clear and cold night on our trip, with temperatures dropping to -3 F (-19 C) just before sunrise. 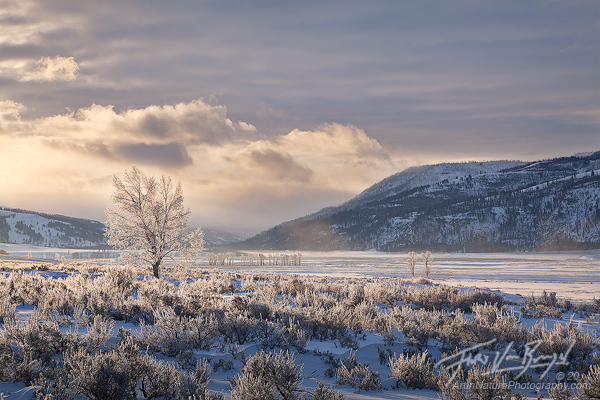 Under these conditions everything – both plants and wildlife – in the Lamar Valley became encased in frost. 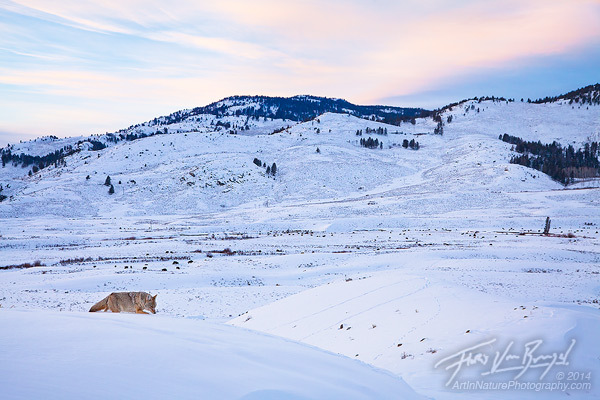 After sunrise, we began a long snow-shoe hike up to one of the ridges surrounding the Lamar Valley to get a better view of a wolf (see previous post). The ridge provided a unique viewpoint of the landscape, and of course, the wildlife down below. For a brief moment the bison and lone frosted cottonwoods came together in an intriguing composition. Ditto! That Pronghorn shot is stunning. Amazing picture. Winter makes everything so beautiful! As a pure landscape, “Frosted Lamar” is absolutely spectacular to me, but “Snowglobe” (great title BTW!) and “Sunset Hunt” are some of the best wildlife images I’ve ever seen. I really like the fact that you’ve included the landscape they call home and not just the animals themselves, it really gives a much better feeling of being there and it also tells a story of their life.